Situated on the world famous St. Lawrence Gap, this luxury complex is centrally located in a section of The Gap that has a local feel. From the condo, it is a short walk to many shops, great restaurants and ample night life with live entertainment. A mini mart is conveniently located adjacent to the complex and a bank is a short walk down the Gap. Dover Beach is less than a 100 yards away. While Dover Beach is only a quarter mile long, it offers waves big enough to surf as well as water that is calm enough for the inexperienced swimmer to negotiate. Chairs and umbrellas can be rented for a small fee (ask for Kenny). In addition, you can enjoy water sports - diving, snorkeling, sailing, surfing, windsurfing, paragliding and jet skiing. There are many types of tours/excursions available or you can tour yourself by renting a car. One of the best excursions is spending a day on a large catamaran that takes you along the west coast of the island to places where you can snorkel with sea turtles and see many tropical fish swimming among a historic shipwreck. Rockley Golf course is only 2 miles from the apartment and the Barbados Golf Club is only 3 miles away. Tennis courts can be rented at the Southern Palms hotel just down the road. There is also a fitness center next to the complex which can be accessed for a small fee. Oistins, the fishing hub of the island is a quick 10 minute cab ride away. There you can enjoy the fresh fish of the day and an entertaining carnival atmosphere. Bridgetown, the Capital, which is the main port, offers even more great shopping and is only a 20 minute cab ride away. This beautifully furnished and spacious condo features a master bedroom, en-suite, with a queen size bed and access to the balcony. The second bedroom also has a queen size bed. The third bedroom has 2 twin beds. Each bedroom has ample closet space. Linens, bath and beach towels are provided as well as maid service twice a week. All rooms including the dining area and living room (which also offers access to the balcony) have air conditioners as well as ceiling fans. The unit also boasts a modern, fully equipped kitchen with a dish washer, ice maker-water filtering two door refrigerator, microwave, coffee-maker and toaster oven. Cable TV, a DVD player and stereo/CD player as well as internet access (sorry, no computer supplied) are also part of this unit. A washer and dryer are also located in the apartment. Off street parking is located in the rear of the complex. This complex is also wheelchair friendly. Two other notes: There is a hair dryer in the master bathroom. The electrical outlets in Barbados are the same as those in the US. There is a US $75 fee for housekeeping. Three weeks of relaxation & fun. We were so happy we rented this apartment-so conveniently placed for the beach-Dover,St Lawrence Gap entertainment,across the road from a convenience store,taxis just round the corner , the local bus route 5 mins walk away & some great eating places within easy walking distances. The apartment met all our needs. The description of all amenities were accurate,beds were comfortable & the place was very clean. Rob the owner was very prompt in answering all our emails & all questions thrown at him. The staff from the management company that looked after the apartment were also very efficient (shout out to Katherine who met us on our arrival at the apartment & answered any outstanding questions especially about the island & Gregg who was also very helpful in sorting out the AC) I must also mention Oretta who came to the apartment every three days to clean & replace linen & towels-she did a wonderful job. We enjoyed Barbados-where you can be as lively or as relaxed as you wish. Most nights after some activity or not during the day - we would relax on the balcony-drink in hand waiting for the entertainment from the Jazz bar Scoopies across the road. Some nights we would even join in & do some dancing!! All entertainment finished at midnight. The noise might not appeal to everyone but we loved it-after all it is Barbados. Just a note though if you didn't want the noise we found just be shutting all the doors you heard very little. I would highly recommend this safe & modern property in a great location. We stayed at the Terraces back in November and it was perfect! Rob was extremely helpful and patiently answering all of our questions. It was our first time to Barbados and he made it very easy to plan. We travelled with 5 adults/1 child and the condo was a perfect fit for us. Everything in the unit is exactly as seen and described. You will not be disappointed! The condo does not have a pool, however other than that, it was where you wanted to be. Steps away from the beach, restaurants, casinos and grocery store and minutes from the airport. If you need a taxi they are just around the corner. Keep in mind there are two bars directly across the street, but we loved sitting on the balcony and listening to the Jazz music coming from the bars and people watching! I would highly recommend this beautiful, safe and modern property to anyone! Just book it! What a wonderful spot in Paradise. Close to everything yet a few minute walk away from the center of tourism. Feels like local Barbados. Condo has everything you could want or need in your home away from home. Small grocery store next door. Larger store about a 15 minute walk away. Descriptions and pictures accurately describe this lovely spot. Rob was great to deal with as was Greg when we arrived. 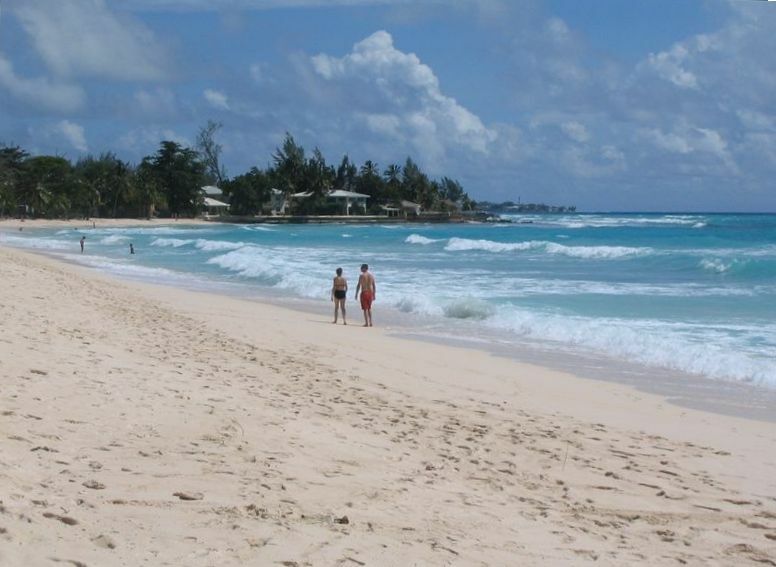 Dover Beach is a 2 minute walk away. Local buses about a 10 minute walk. This place has a great location, is safe and the perfect spot for a great vacation. Would highly recommend. We stayed here to celebrate my daughter's 6yr old bday. The place is exactly as described, everything went smoothly from the initial contact thru this site all the way to departure. The beach is nearby, taxis are right outside the condo and is not expensive to get to anywhere on the island. We stopped at a grocery store before heading home after our first day out exploring, we supplemented with supplies from the mini mart next door and i brought some food items and basic necessities from home. The beach is walking distance and we walked there easily with my 6yr old and 1 yr old (in a stroller) daily. The condo is clean, well furnished and had plenty of space for my family of 5 adults and our 2 kids. The place is comfortable with a/c in every room (we had family members that stayed somewhere else not realizing that a/c is not central and is not standard in every room of a rental). Robert is prompt in answering all my questions and the management company was efficient in checking us in and out. Everyone had such a great time. Thank you very much for sharing your home with us and we look forward to going back there again! My friends and I stayed in this condo for our annual Crop Over trip which lasts 8 days. The property was beautiful and in the most convenient location. The owner was very helpful and always available via email to answer any quesions we had prior to our arrival. The pictures don't do the place any justice. There were no problems with anything within the unit during our stay and the cleaning lady was very nice. I have nothing bad to say about unit 202. We plan to book this unit for next year as well! P.S. thanks for having boogie boards in the house...they were such a perk! I can't express the most wonderful time I had in this condo!!! Beds were very comfortable and the condo was very spacious. Stores are so convenient!!!! Beach is accessible anywhere you go! Who could ask for anything more!!!!! Balance payment due to the agent upon arrival. If you use a credit card to make your down payment there will be a 3% surcharge.